There are, in a turtle tallier’s year, occasional days that stand out. Saturday June 13 was one for me. I was taking part in Ontario Bioblitz 2015, a frenzied 24 hour survey of the plants and animals inhabiting the Don River Watershed. My Bioblitz assignment was to co-lead a group in search of reptiles and amphibians at Tommy Thompson Park on the Leslie Street Spit. Dark, scudding cloud was swept away by the wind just prior to the start of the Bioblitz at 12 noon. The sun emerged, summoning the turtles of the Leslie Street Spit to their basking sites. We tallied six species of turtles, the largest number of species I’ve ever seen in one day – particularly remarkable considering that the spit extends from the coastline of Canada’s largest city. In the shadow of the skyscrapers of downtown Toronto, the Leslie Street Spit is a haven for reptiles. The most remarkable turtle sighting of the day? A (suspected) Eastern Spiny Softshell! My co-leader Kristen Martyn spotted this turtle in one of the Spit’s large interior wetlands. Initially, from a great distance we thought “Snapping Turtle”. We simply weren’t prepared for a softshell, so we sought to reconcile the sighting with what we were expecting to see. It soon became clear that it was, in fact, a softshell – a true rarity. Kristen and I were ecstatic and our enthusiasm inspired the whole group of herptile enthusiasts. We approached the wetland as close as we could, straining for a better look. I hope that this female found a male to mate with this spring and that she produced viable eggs. Her species hangs by a thread in this area. May her presence indicate that her magnificent species may someday become a more common site in the GTA. Kudos must be extended to the Toronto Region Conservation Authority for their management of Tommy Thompson Park. They are transforming parts of this industrial landscape into some of the finest natural habitat in Toronto. Native wetland plants have been established. Basking sites for turtles have been created. Private automobiles are verboten at Tommy Thompson. Even dog walking is prohibited – what wonderful enlightened policy! Without TRCA’s good works, it is doubtful the softshell would have been present. 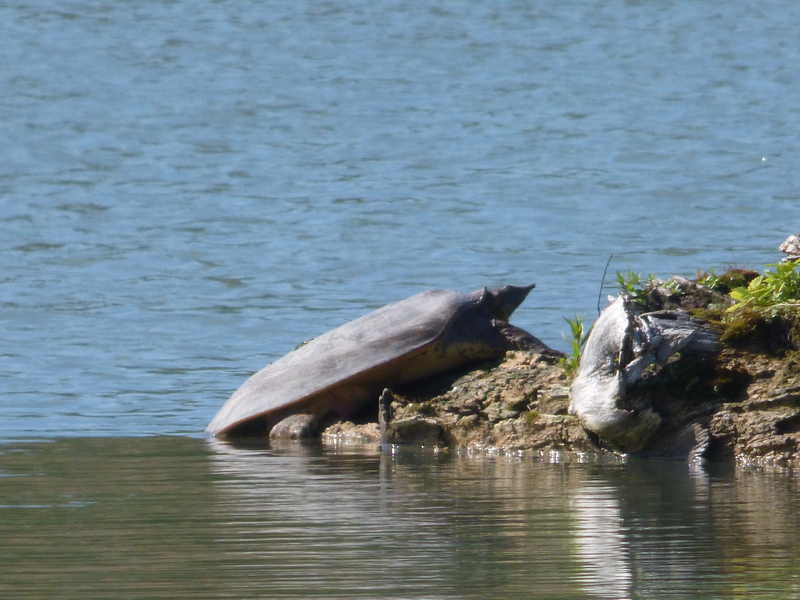 You can also help turtles by participating in Adopt-A-Pond’s Ontario Turtle Tally! This citizen science programme collects turtle sightings from volunteers across the province. All the data we collect helps us to identify where turtles live, and helps guide work with our partners to protect turtle habitat! Become a Turtle Tallier today!